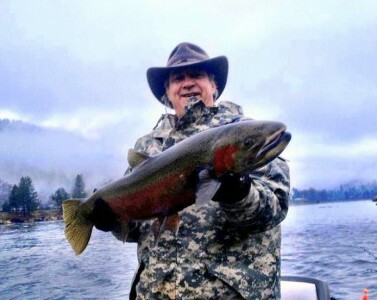 Last weekend the raise in water level and clarity pulled the Steelhead in closer to shore and into some slower water. We targeted them by drift and bobber on our casting rods and had great luck on single handed fly rods with strike indicators and glo-bugs. The February outlook is good to great if you know where they hang out on any given day, depending on water and weather conditions. The amount of pressure by fellow fisherman is down even though fish are being caught and will continue to be caught. There are a bunch of big Fish in the system this year. I lost a couple much bigger than the one in the photo this last weekend, I done got spooled and can’t hardly think of anything funner than that.